Wildlife Wednesday: Meet Wheels at Disney’s Animal Kingdom! 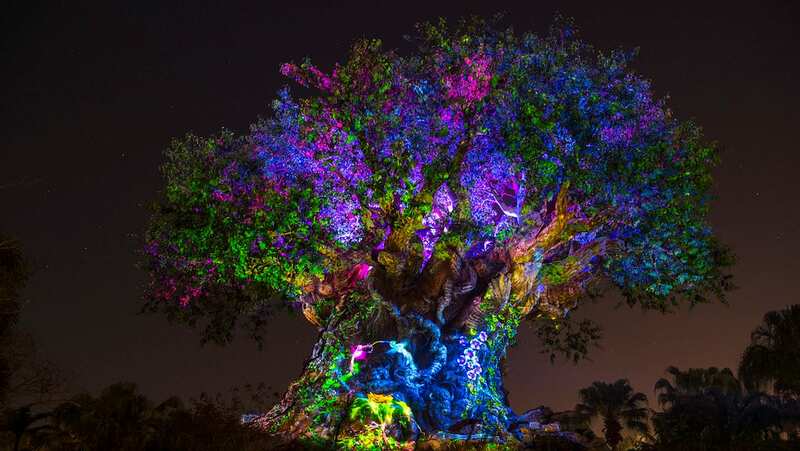 In the past, I have shared with you many examples of the excellent care our team of professionals gives the animals you see at Walt Disney World Resort. We also help rehabilitate native wildlife, which includes birds, snakes, armadillos, manatees and more. 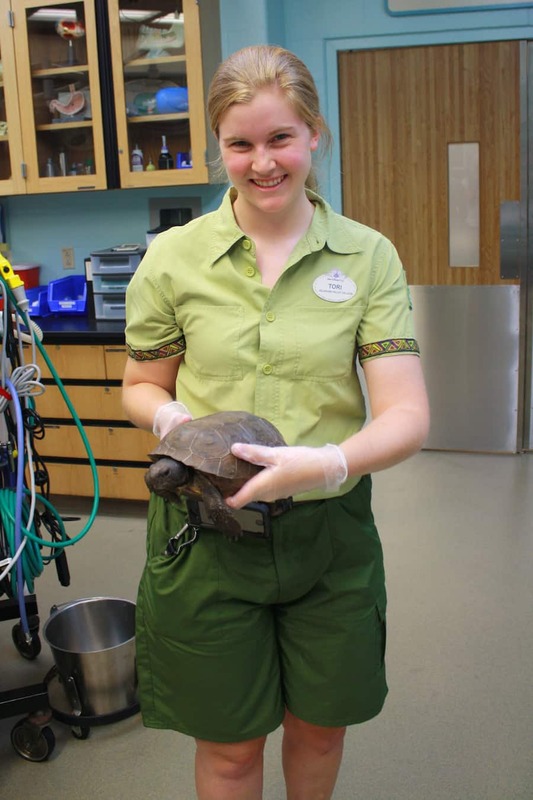 Recently, we began caring for a native gopher tortoise. While we don’t know how he was injured, we believe he might have been hit by an automobile. Our veterinarians, veterinary technicians, hospital keepers, and wildlife interns have been working closely with this gopher tortoise during the past month. 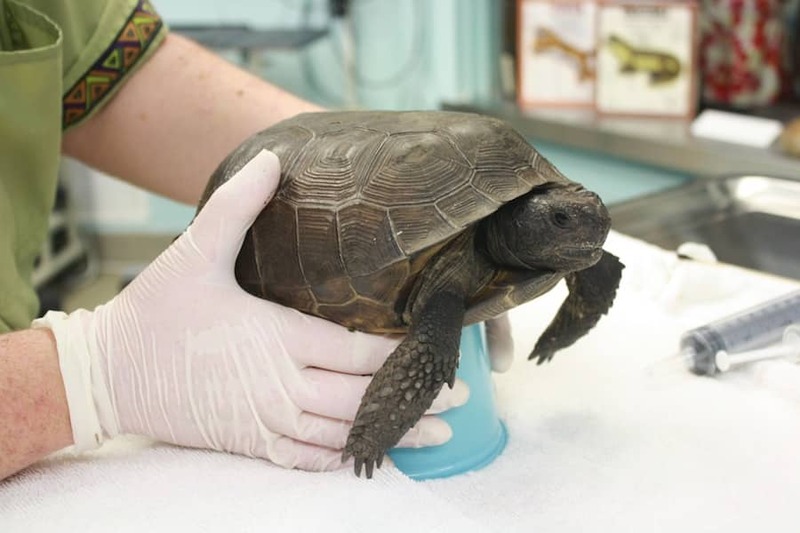 The tortoise sustained an injury to the back of his shell that also affected his back legs. After brainstorming different ideas to help him maneuver better, a suggestion was made about giving him wheels. But how? One of our veterinarians attached LEGO blocks with an animal-friendly epoxy resin reinforced with tape to the bottom of his shell. 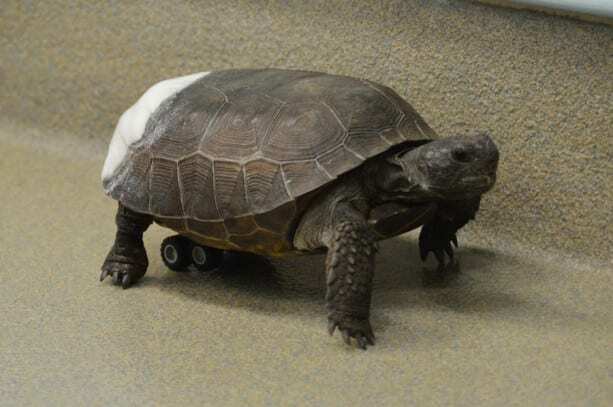 Within minutes, the tortoise we are now calling Wheels began walking across the hospital floor. It was a success! 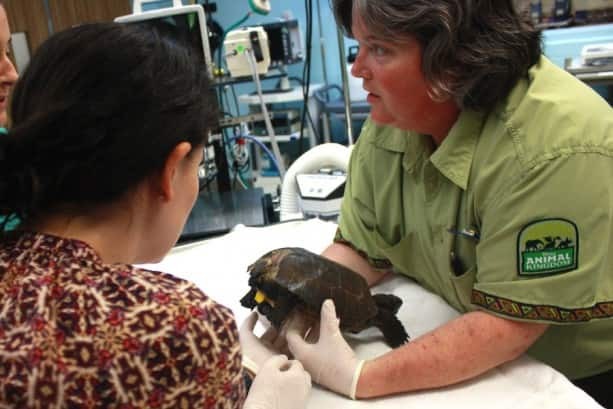 Hospital keepers Jennifer Holmes and Jen Hershey act as mentors to our Wildlife Hospital professional interns, Tori D’Amico and Brandon Waldron. They all continue to monitor Wheels to make sure he is comfortable and able to move around. The team expects Wheels to stay with them for a while as his health improves. Wheels’ wheels will be modified throughout his healing process to ensure the best fit. 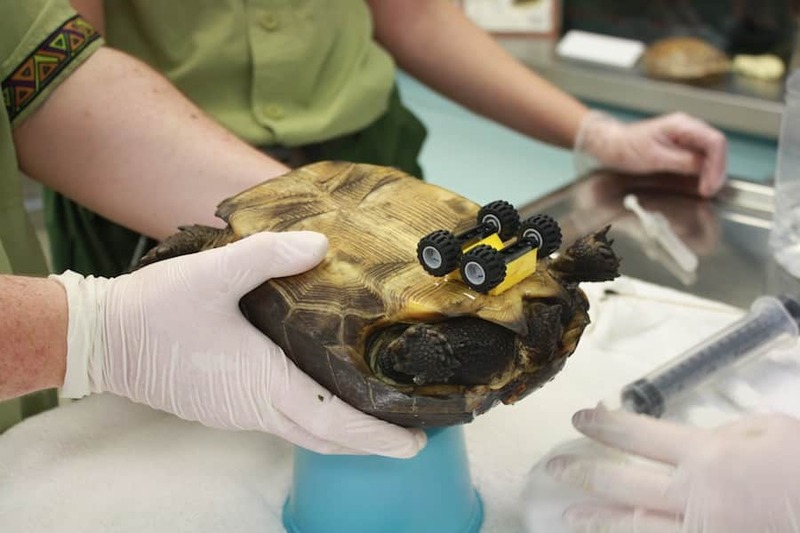 When the team feels confident that he is fully healed and able to be released into the wild, they will remove his wheels. The gopher tortoise is a protected species, native to the southeastern United States. These tortoises dig deep burrows that are sometimes filled in by land developments and construction. The gopher tortoise is also a keystone species because other animals, such as snakes and eastern indigos, also live in their burrows. The next time you visit Disney’s Animal Kingdom, you might be able to catch a glimpse of Wheels at Rafiki’s Planet Watch in the on-stage procedure room! Share Wildlife Wednesday: Meet Wheels at Disney’s Animal Kingdom! I love this story, I’d love to share it on Facebook but you have no link to do that. This story is heartfelt. I love the idea about using Lego wheels to ultimately be the proclamation of his new-found mobile culture. A huge congratulations to the team for their hard work and care that is going to these animals. It is truly amazing to see how much they care for the animals of the world. 🙂 Wishing Wheels a speedy recovery! All the best! He needs a racing stripe. Congratulations to Wheels & to all the vetranarian staff that helped with the success of his recovery. Thank you for all you do! I hope that Wheels will have a happy & healthy life.